A savory coffee companion that surfaces only on Fridays and Saturdays. Lurking within: delicious curry designed to go with coffee. Apologies to our associate art director, Sara D'Eugenio, who takes beautiful food photos and will no doubt be horrified by this janky iPhone shot. On Fridays and Saturdays before he goes to work at the Space Needle, Harold Fields makes his rounds, dropping off a handful of curry buns—sometimes nine, maybe a dozen—at just a few coffee shops around Seattle. They've become a favorite at Tin Umbrella in Hillman City, say staff; down in Georgetown the curry buns get delivered Saturday morning and are gone by the end of the day. Fields is a sous chef at SkyCity restaurant and runs a yakitori-focused catering business, Umami Kushi with a particular flair for sauces and condiments. 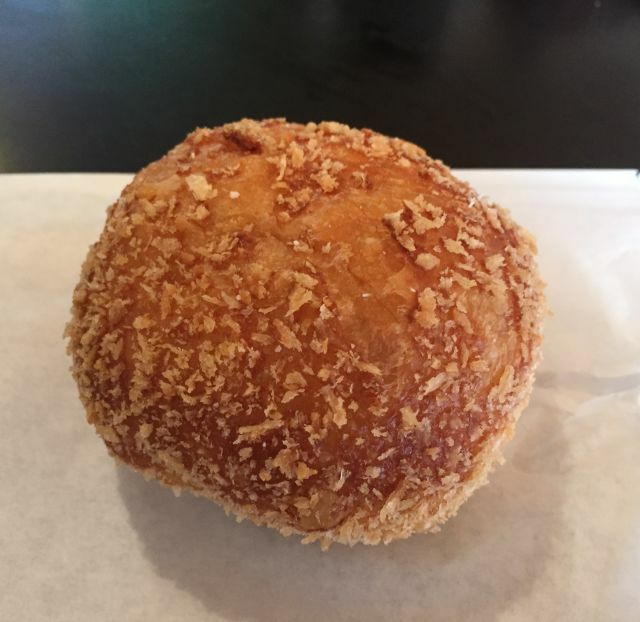 Now he’s added this new project—making Japanese-style curry buns as a snack for coffee shops. “A lot of coffee shops seem to have the same pastries,” says Fields. And he’s a guy who likes his coffee with something savory, not sweet. His time cooking and training in Japan left him with a fondness for the nation's curry pan (pan means bread in Japanese) though coffee shops around here tend to refer to them as curry buns. I’ve had a soft spot for curry pan ever since trying the ones at Fuji Bakery maybe five years ago. Fields’ version consists of a light-as-air brioche-type dough stuffed with curry, coated in panko, and deep fried. Fields keeps the curry on the milder side so it harmonizes with coffee and dials up the meatiness, since that’s how customers seem to like it in the US. Seattle chefs seem pretty adept at coming up with new models for getting their food in people’s hands that don’t involve opening a restaurant (See: farmers market food vendors, pop-ups, anything involving Monica Dimas). Between curry buns and breakfast tacos, could coffee shops be our next window into up-and-coming foodstuffs? Fields doesn’t really have details online (he likes the under-the-radar nature, plus all his gigs don’t leave much time to update his website) but you can find them at the following: Tin Umbrella, Tougo, The Station, Empire Espresso, All City Coffee, QED Coffee, The Feed Store, The Conservatory, and Lottie’s Lounge. He delivers either Friday or Saturday, depending on the coffee shop.